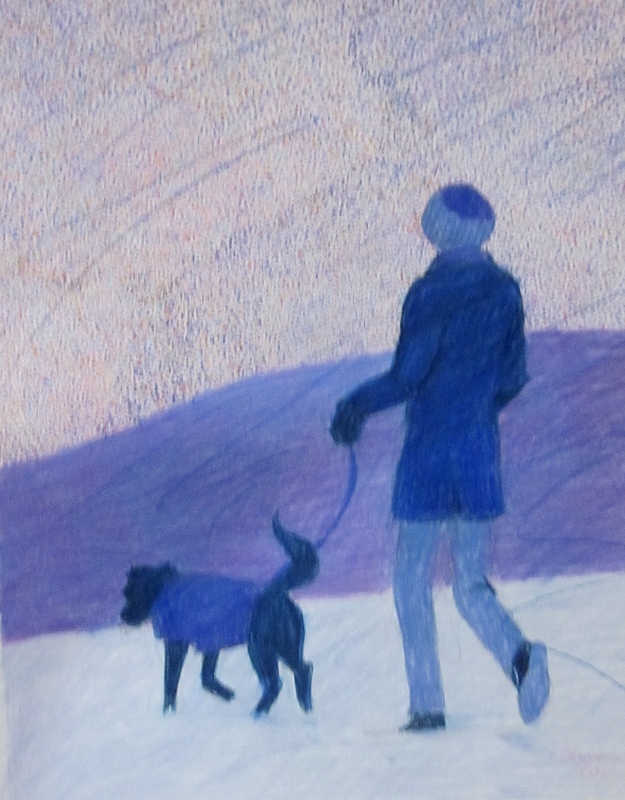 A few years ago, while I still lived in New York City, I did a drawing of a man walking his dog in a snowstorm. It’s called “January 2nd” because that’s when life gets back to normal, and the holiday stress is gone. I just exhibited this in a local show, here in Danbury. One viewer said the background reminded him of the eye doctor test for colorblindness! He kept looking in the dots for a hidden number. It’s hard to tell from this photo, but there are a lot of darn dots in the background. Funny, I don’t remember doing it. I must have had some really good music playing to take my mind off of the tedium. Otherwise, something this boring to do would have stuck in my mind, as it did when I was drawing flower after flower in Floral Overload. So, I’m back at it….doing dots. So, this will take a while. I promise to have a new picture as soon as my sanity permits.